Detroit’s StockX, a stock market for high-demand, limited-edition consumer goods, Tuesday announced it has added Supreme skate decks and Fear of God streetwear to its marketplace. Fear of God follows April 2017’s addition of BAPE and Palace, as well as a collection of KAWS figures and apparel from last month. The addition of the skate decks makes the largest collection of authentic Supreme merchandise available for sale in the world. StockX now offers more than 80 decks from releases dating back as far as the fall/winter 2013 season. The collection features artwork from a handful of artists, including world-renowned artists such as H.R. Giger and Raymond Pettibon. Many of the decks display images of pop culture icons, including Michael Jackson, Scarface, Akira, and more. 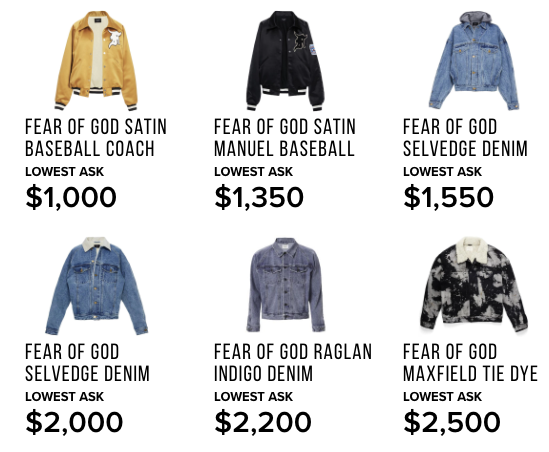 Fear of God, a Los Angeles brand helmed by Jerry Lorenzo, launched on StockX on Tuesday with a 400-piece catalog that includes items from the Fourth Collection, Fifth Collection, and the most recently released ESSENTIALS collection, which was introduced at PacSun April 2018. ESSENTIALS includes collaboration pieces with ReadyMade, JungleGurl, New Era, and others. StockX was founded by Luber, Greg Schwartz, StockX COO, and Dan Gilbert, founder and chairman of Quicken Loans. The new luxury marketplace has investors including Eminem, Mark Wahlberg, Ted Leonsis, Tim Armstrong, Scooter Braun, and Ron Conway. It was launched in February 2016 and is comprised of more than 350 team members and a $730 million annualized GMV run rate.